Danielle did such great job on our engagement photos that I hired her for our wedding and I’m glad we did!! The photos look great and she managed to get everything, even the table decorations. I would recommend Danielle to anyone who wants to remember how wonderful their wedding was! THANKS! Excellent photos and great price, but took her a little longer to complete than we would've liked. Our wedding was her first big project so I gave her a benefit of a doubt. Like I said photos came out great - recommend giving a firm time line though. 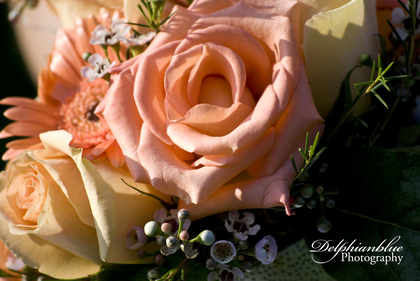 I am very happy my husband and I had Delphianblue Photography photograph our wedding!Danielle did everything we asked for and was very understanding of what we wanted in a photographer. I have had many people tell me we had a really good photographer. We have so many great photo's! Things get a little nuts planning a wedding and when the day comes it feels good to know the special memories of that day are in good hands!